The Episode starts with Abhi telling Disha about Pragya’s accident. Disha asks Bahadur to take Kiara to room. He collides with Tanu. She scolds him. Bahadur tells her about Pragya’s accident. Tanu goes to Aaliya and tells her. Aaliya says King must have done this because of my provocation and killed her. Tanu thanks her for returning her Abhi and says I will go there and give my shoulder to Abhi for crying. Abhi is leaving. Dadi says she will also come. Abhi asks her to take care of everyone. Kiara comes and calls him daddy, asks where is mumma? Aaliya calls her and tells that she is Aaliya Bua. Kiara says your face resembles Daddy. Aaliya says even you look like him. Kiara says Mamma says same and asks where is she? Tanu thinks Aaliya is acting and left her behind in acting. Aaliya asks her to come to her room. Kiara asks where is my mum? Aaliya says your dad will bring her and asks her to come. Tanu says I love you my would be daughter. She tells Abhi that she felt bad hearing about Pragya’s accident and says God shall rest her soul in peace. Disha shouts Tanu. Dadi sees Pragya coming and smiles. Abhi relaxes seeing her. Pragya hugs Dadi and Disha and says she is fine. Abhi asks her to kill him for once. Pragya says you don’t let me die as I remember you. He hugs her. Allah Wariyan plays…..King comes and is shocked. Aaliya thinks she can’t think bad about her niece as she is her brother’s daughter. Kiara comes and greets King. She introduces Aaliya as her bahu. Pragya tells Abhi that King saved her today and she reached here because of him. Abhi hugs King. A fb is shown, after the accident, King thinks how I will live without Pragya. He says sorry. Pragya asks him to take her to Abhi and says he might be worried. King says ofcourse we will go there. He insists asking her to come to hospital first before going to Mehra mansion. Fb ends. King tells Abhi that if anything had happened to Pragya then I wouldn’t have forgiven myself. Tanu thinks King is like her and acting innocent. King tells Abhi that he is very lucky. Dasi tells that they shall dance. Kiara tells Pragya that she is very upset with them. Abhi says I told her about our past. They go to convince Kiara. Aaliya thinks where is Tanu and King and thinks if she went to talk to king. King feels guilty of his actions and tells the same. Tanu hears him and asks him to say why do I love her. She calls him road side lover and loser and says you tried to kill Pragya. King asks her not to provoke him to fulfill her wish, and says I know you are jealous of Pragya. Tanu says you are a fool and says I never attacked my love Abhi, but you tried to kill her but failed. King says you will not understand, but Aaliya will. He says your problem is that you are thinking of your stubbornness as your love. Tanu goes upset. Chachi comes there and tells King that if he is behind the accident then she is feeling ashamed to have nephew like him. She says I hope I am wrong. Abhi and Pragya talk to Kiara. Kiara says you would have told me atleast. Pragya and Abhi convince her. Sunny comes there. Abhi asks Kiara to do their ghat bandhan. Kiara asks what is it? Abhi tells her about it and asks Sunny to take Kiara downstairs. Kiara says I have a condition and says I want chocolates, pizza and cold drink. Pragya refuses. Abhi says I will get it. Pragya asks if she is okay that they can’t stay with King now. Kiara says we will meet him sometimes. Purab tells that they are taking too much time to convince a baby. Tanu thinks nobody is thinking or asking about me. Raj asks Mitali if she told anything to Kiara. Mitali says she is changed and happy now. She says even Aaliya is changed. Sunny comes and says Kiara wants everyone to give her attention. Abhi says she is upset and wants us to give her chocolates, burgers etc and says she asked why did we hide from her. He thanks King for doing so much for Kiara. Abhic dances. King claps. Kiara and Pragya come there. jab tak sanson ki….song plays. Everyone is dancing. 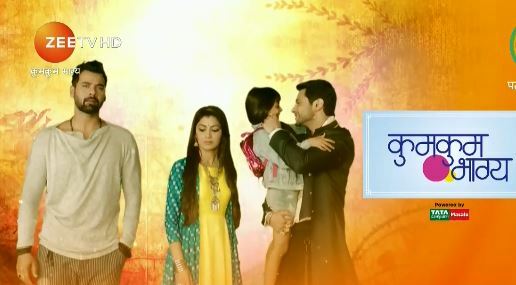 Abhi lifts Pragya and dances. King looks on upset. Abhi gives promise to Pragya that he will never let any distance come between them. Pragya promises that she will not let any third person come in between them. Kiara asks then where will I go? Abhi says you are ours Abhigya….Pragya smiles. King is upset.